Simon Holloway, a champion of the STC’s ACES special interest group, overcame severe leg cramps to complete the recent London Marathon in aid of the Children with Cancer UK charity and now says his next ambition is a tri-athlon! Simon ran into problems at the 18-mile mark and needed to stop several times for some physiotherapy before eventually crossing the line in a whisker under five hours. And it’s still not too late to make a contribution via Simon’s Just Giving page online and help him hit his cash target. Simon is not only heavily involved with the STC but also Commercial Director for the famed RML Group Ltd company in Wellingborough. Its expertise in automotive design and construction – particularly in light-weighting, powertrains and electric technology – makes it highly regarded not just within the Cluster but internationally as well. Simon has recently been in China with the Department for International Trade investigating opportunities in the region. 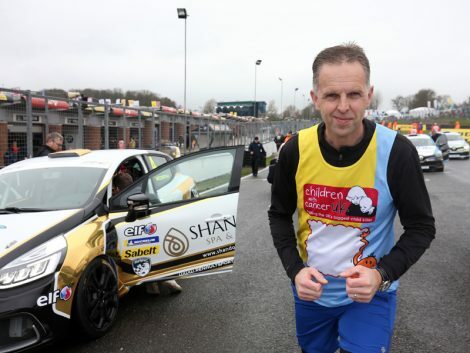 Simon is pictured in his London Marathon kit during a recent motorsport event at which he was serving as chief data analyst for the Renault UK Clio Cup.